The only Scot officiating at next summer’s Women’s World Cup says it is “surreal and hasn’t quite sunk in”. Police officer Kylie Cockburn, 30, has been selected as an assistant referee for France 2019, which also marks Scotland’s first World Cup. The Baillieston official has refereed domestic men’s games and been an assistant at Scottish Premiership level over the past four years. “I never thought I’d get there,” she told BBC Scotland. “The difference between domestic football and World Cup football is the nerves, because it’s a world stage and you know people from everywhere are watching. 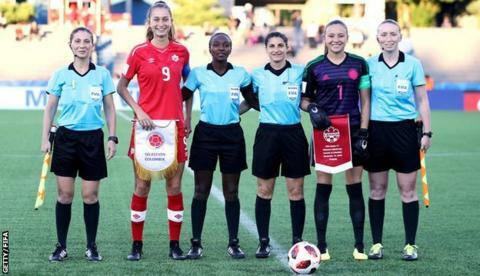 Cockburn recently returned from Uruguay, where she was involved in the Under-17 Women’s World Cup, and last year she officiated at the Algarve Cup, in which the top women’s nations compete. She will now join 27 referees and 47 other assistants in overseeing the eighth edition of the World Cup. “When I started one of my main goals was to referee at a World Cup,” she said. “Now I’m allowing myself to realise it’s going to happen your head then thinks the next thing is the final – that would be my aim to work hard and put myself in contention for the best matches.